The most southerly city in Egypt, Aswan is known for its Nubian past and for being an important gateway into Africa. 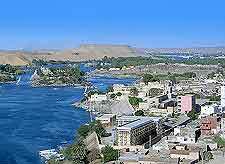 Aswan offers a very relaxing place to holiday and a scenic setting next to the Egypt's enormous River Nile. The stretch of the River Nile around Aswan is particularly beautiful and flows past many enormous boulders of granite. There are numerous islands within the middle of the Nile, close to central Aswan, which are often studded with tropical palm trees and offer an exotic feeling. Elephantine Island is the biggest of these islands and home to the Nubian villages of both Koti and Siou, both of which are more than worthy of exlporation. 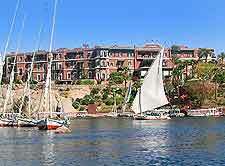 Tourism in Aswan is increasing and many hotels and restaurants flank the riverside street, the Corniche el-Nile. For tourist information, the tourist office on the Midan al-Mahatta is extremely easy to find and conveniently close to the city's busy train station. There is plenty is Aswan for those looking for an authentic Egyptian holiday. Tourists can start the day with a relaxing cruise along the Nile, onboard a small, traditonal 'felucca' boat, before enjoying a camel ride to the Monastery of St. Simeon. Do also leave enough time to visit the spectacular botanical gardens on Kitchener's Island, and the Unfinished Obelisk, a stone monument of epic proprortions, abandoned after a serious crack appeared in the granite. Aswan is also very famous for its High Dam, an embankment dam built to control the River Nile and create the vast reservoir, Lake Nasser. 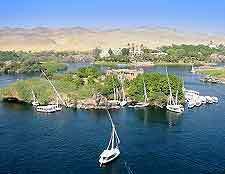 More information about Aswan Tourist Attractions. 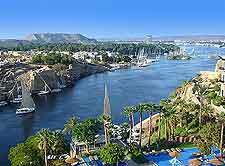 Aswan's history is positively ancient and the boasts many exceptional Coptic, Islamic and Pharaonic monuments to the past. 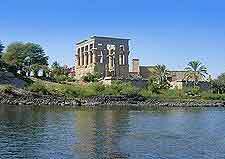 One of the oldest of the city's many landmarks is the Philae Temple and dates back to the 7th century BC. 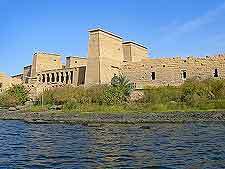 However, in the 1970s, the Philae Temple was actually successfully relocated to the nearby island of Agilkia, after suffering continual flood damage. Also in Aswan are the more modern 20th-century landmarks of the Egyptian Russian Friendship Monument and the Coptic Orthodox Cathedral. Close to Kitchener's Island, the Tombs of the Nobles are considerably older and feature the elaborate burial tombs of many wealthy Egyptian princes and dignitaries. More information about Aswan Landmarks and Monuments. With so much history to go round in Aswan, a number of museums have cropped up in recent years, as places to store local Egyptian relics. With endless information about the Nubia civilisation from pre-historic times onwards, the Nubia Museum contains a number of very details models, with illustrate the Nile Valley and its surrounding sights. Another must to add to any itinerary is the Aswan Museum and the adjacent Ruins of Abu, where some archaeological excavations are currently still in progress. The popularity of the city's International Sculpture Symposium has also resulted in the arrival of the relatively new Sculptures Park, which is filled with granite masterpieces. More information about Aswan Museums. There are a number of exceptional sights in southern Egypt and a number of these world-class attractions are extremely close to Aswan. The village of Abu Simbel is particularly noteworthy and has become an extremely popular day trip from Aswan. Tourists flock to Abu Simbel each day, catching early morning buses, and reaching the spectacular, relocated temples of Ramses II and Hathor with plenty of time to explore them fully. Much closer to home, the Old Dam (Low Dam) is often also of interest and measures over 2,000 metres / 6,560 feet in length, while the Kalabsha Temple and ab outstanding Nubian monument and is actually one of the largest free-standing temples in Egypt. The city of Luxor lies directly north and alongside the River Nile, and whilst this is really to far for a day trip, this is a perfect place to visit if you are planning to tour the main tourist destination in this part of Egypt. 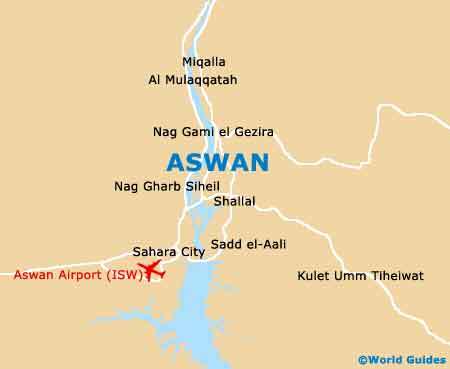 More information about Aswan Attractions Nearby.